The life of the Dungeness B nuclear power station in Kent is to be extended by 10 years up to 2018. 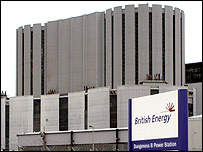 The announcement was made on Thursday by the plant's operator British Energy. The company called it great news because of the economic benefit and jobs boost that the extension would provide for the Romney Marsh area. The move was criticised by the South East's Green MEP, Caroline Lucas, who said investment was needed in renewable energy sources and conservation. Construction began on Dungeness B in 1966 and it started supplying electricity to the National Grid in April 1983. It has produced 75.87 terawatt hours (TWh) of generation since then, an amount which could provide all of Greater London and the South East with enough electricity for a year. The power station employs around 550 full-time staff and invests an estimated £30m a year into the surrounding area. Station director Alan Oulton said the decision to extend Dungeness B's lifetime had been reached after several months of work and investigation. "There's been a lot of investment into the plant and a lot of technical development. "This decision has been made on a commercial footing and with a technical investigation that's taken several months, looking at all the angles, and that has involved outside bodies to make sure that the arguments are very sound. "This is going to provide jobs for the Romney Marsh community and beyond and for the young people up to 2018." But Ms Lucas described it as "enormously disappointing news". "We know that nuclear power stations have inherent environmental risks, we know that they're producing nuclear waste that we still don't know what to do with. "Nuclear power is extremely uneconomic and I think it's a mistaken choice and a wasted opportunity. "We should be putting massive investment into renewables and conservation." 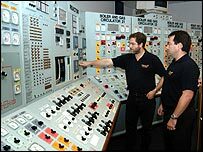 Mr Oulton argued that renewable sources of energy were "not yet there to take its [nuclear power's] place".